You may think you know how to hang pictures on your wall, but there are huge differences between picture hanging on drywall and on masonry or brick walls. To hang a picture on a brick wall, it's crucial to use picture hangers that are designed for masonry. You can use one of two picture hangers depending on the amount of masonry around the brick: brick clips or brick hooks (also called wall anchors). 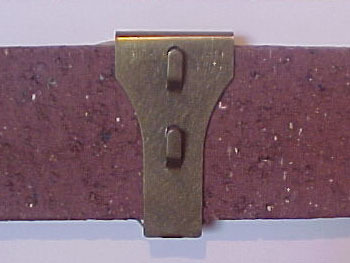 Brick clips (or brick clamps) cost approximately $5.00 for a pack of two, and can be purchased at Hobby Lobby, at some hardware stores, or online. You will need not need tools to install these clips, but they're only effective for hanging pictures on brick that is exposed at least 1/8 inch. Measure the exposed dimension of your brick to ensure accurate size choice. Install the brick clip onto the exposed end of the brick by hooking the bottom spring end onto the brick then snapping the top tooth end in place. Check to make sure the clip is flush against the brick. If the item weighs more than 25 pounds, add additional clips as needed. Hang your picture using either the top or the bottom hook on the brick clip. Your second option is to use a brick hook (also known as a wall anchor). Brick hooks are essentially hooks with nails that do not bend. Brick hooks cost approximately $3.00 for a set of two and can be purchased online or in hardware stores; they make great wall hangers for walls where the brick isn't exposed past the mortar. To install these wall hooks, you will need a drill, a 1/8 inch masonry drill bit, and a small hammer. These hanging hooks are best suited to bricks where the mortar is flush with the end of the brick. Measure and mark the place where you will hang the picture. Since you are making a hole in the brick masonry, you do not want to make a mistake. Choose the brick hook(s) according to the weight of the picture. Drill a starter hole with the 1/8" diameter masonry bit into the mortar of the brick. Drilling into the brick may cause it to crack. Install the hook onto the wall by tapping it with the nail into the hole that you started with the drill. Hang the picture on the installed brick hook. You will not need tools to install the brick clip. For the Brick hook you will need a drip bit with a 1/8 inch drill bit and a small hammer. Weigh your picture to ensure the picture hook or clip will hold it. Measure and mark the place where you will hang the picture before starting. I would have saved myself the trouble had I read this before. Thank you.